Malli Mastan Babu went to NIT, IIT and IIM. When he was done with them, he went and climbed Everest. It would have seemed like the opening lines of a fiction novel, however the only difference being that Babu and his exceptional achievements are for real. When he was small, Malli’s spark of inspiration was ignited by the valiant story of Lt MUB Rao who with other members of an Indian Army Expedition lost their lives in an avalanche while trying to scale Mt Everest. He worked a brief period as a senior software engineer at Satyam Computer Services Ltd for three years before his MBA (IIM C 04). However, years later, having proven his academic brilliance at NIT, IIT and IIM, Malli would forgo a regular corporate career to pursue an extraordinary dream. That dream was to climb the highest peak in the world. Soon, along with Mt Everest he would go on to ascend the highest peaks of each of the seven continents in the fastest time in history (Just 172 days). 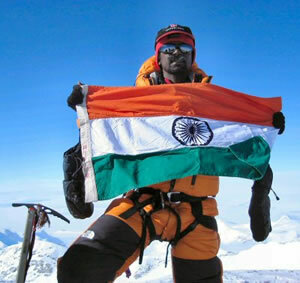 Malli Mastan Babu is living his passion and dream every day - of doing what he has always wanted to do. We caught up with him in between his busy outdoor schedule and asked him about his passion, times at the institutes he studied in amongst other things. 1) We read about your interests in pursuing outdoor adventure activities from early on in life. Who was your inspiration? Can you tell us a little more about that? Attempting to climb Everest was my childhood dream. It somehow went into my mid after watching the unveiling of Lt. M.Uday Bhasker Rao when I was 11yrs old at Sainik School Korukonda, Andhra Pradesh. Lt. M.U.B Rao was part of 1985 Indian Army Expedition that lost 6 officers above 26,000ft when bad weather hit them. 2) As a student you ran the Adventure club at IIM Calcutta in 2003 and organized treks in western Himalayas, skiing, rock climbing, rafting and Vipaassana meditation courses. How did you balance your passions with the demands of the academic program at that stage? Also, what kind of a response did you get from the students in terms of interest shown in the field? Yes, I did organize Adventure activities similar to that of any other campus club which does and my responsibilities were similar to that of any other club president. I guess, Academic institutions have space/scope for incorporating such extra currics. I guess, Students appreciated the club activities well had good spirit about it. 3) You chose to opt out of placements at IIM. Was it an easy decision? What were the reactions of your close ones when you decided to venture into the field of mountaineering after IIM? How did you deal with the cynicism initially when you chose an unconventional route? I really can’t think how difficult was it to opt out of placemets at IIM C But I guess, I was too excited to attempt Everest and lost in its lure to think of difficulties! But later after passing out of IIM, I did feet the difficulties of the tough choice I have made. 4) An increasing number of people are making their choices clear at the placement stage at the IIM. Some of them are now able to identify their interest and passion (mountaineering, music, social work etc) - that too at an early stage. Is it a pointer towards an encouraging trend? 5) You have been a shining example of excellence for everyone. What is your counsel to young professionals who go through tough career and professional choices? How should they look at assessing career-choice decisions? One has to understand what happiness means to him/her and then exercise the choices with a determined mind. I guess the journey to give chance to your dreams will be enriching and not too a painful experience. 6) Tell us a little about your academic & professional background? What do you cherish most from your IIT and IIM days? The experience of being surrounded by great minds and passionate guys thriving to succeed, though Success being defined in one’s own way. I felt impressed and inspired by the knowledge and experience possessed by some of the Profs. 7) You mention ‘I am just living my life the way I want... and to most of the people it's crazy way of living!’ You also ‘don't intend to give up this crazy life in near future either’. There is a lot of passion in the statement about what you are pursuing. How do you manage to keep yourself going mentally when faced with continuous tough challenges? Apart from the inherent passion and talent, how much do you rely on other factors such as yoga, meditation etc to keep yourself focused all the time? 8) You started an adventure tourism company by the name of Mast Adventures. How difficult has it been to sell the concept of adventure tourism? Do you plan to expand your company’s reach across the country? I have postponed the actual organizing of these activities but Ia m actively progressing towards making it a much bigger and strong venture along with the experience, knowledge through my accomplishments. 9) In the 6bridges community there are professionals who want to do their own thing and follow their dreams, but are undecided about making a beginning. What's your message for them? Everybody has these similar thoughts. Those who are living the dreams are the people who have acted upon the choices they made. Stop analysis and act on the choice! 10) What advice do you have for regular professionals who are embedded in their hectic work life and want to pursue adventurous activities as a hobby can do so? Do you feel the decision to do so is more at the mental level? There professionals who are going for adventure activities. It’s more about priorities and strong will power - yes, it’s at mental level. 11) You have climbed 7 summits in the fastest time, which is a remarkable achievement. They include ones that are as diverse as Mt Everest, Mt Aconcagua and Mt.Vinson Massif, which is closest to the South Pole. Which one would you describe as your toughest and most demanding climb as a mountaineer? Vinson massif was extreme on Cold (negative 40 degrees), it was tough to endure it. Everest’s altitude the steep ice walls, sharp ridges over which I have to walk at 27,000ft demanded everything out of me - physical, Mental and Psychological. 12) Your Sainik school alums and your mates from IIT and IIM have been supportive of you by helping out through the rigours of visa and travel etc during your trips to the US, Russia etc? How much do you credit the strong bonds, camaraderie and affiliations that such institutions build during one’s stay there? I cherish the upbringing of my Sainik School. I guess, the shaping years of childhood and Graduation days given the time duration available for interaction would allow people to give chance to several personality limitations between them and hence more bonding that later years. But I had good friends from IIM Calcutta among my batch-mates as well. 13) Do you ever regret anything in life? If you were to go to IIM again, hypothetically, would you make this choice of adventure again? I don’t think I want to make any changes to the life I lived. I don’t want to know anything about my future either. I would want to experience and enjoy the flow of life as it unfolds for me. 14) Now that you have achieved the feat of climbing the 7 summits in record time, what are some of the goals that you have set for yourself in the near future? Have you thought of penning down your experiences in the form of a book sometime? I am writing down my experiences as and when I feel like between the future projects that I plan and research to know more about them. 15) Billy Graham, the American evangelist once said “Winners take time to relish their work, knowing that scaling the mountain is what makes the view from the top so exhilarating.” Mountains enable us to see rare sights that are compellingly beautiful. What is the most beautiful sight you have seen in your climbs? The view from the top of Everest was unbelievable; Climbing in Antarctica was like living another planet. The beauty of mountain valleys with carpets of alpine flowers lakes, clouds streaking from the summits as well as adorning the cliffs and the changing hues of clouds with the variation of sun’s light were all the creation of god. I felt as though I experienced bliss and beauty in nature. I felt very happy! Below are Malli’s plans for his upcoming attempt at the first ever solo circumnavigation of Khangchendzonga (Mt. Kanchenjunga) massif - the tallest peak of India, which involves crossing its glaciers and high passes as close to the mountain as possible and through a new route. Attempt of First ever solo circumnavigation of Khangchendzonga massif by Malli Mastan Babu (World’s Fastest 7 Summiteer), crossing its glaciers and high passes as close to the mountain as possible and through a new route. It requires navigating 8 glaciers, climbing and trekking 10 high passes (16,000 - 21,000ft) through rugged mountain terrain of approximately 800 kms. Khangchendzonga, the tallest peak of India is considered to be the guarding deity of Sikkim; myths galore to elevate its rep of being a revered and esoteric Himalayan giant. 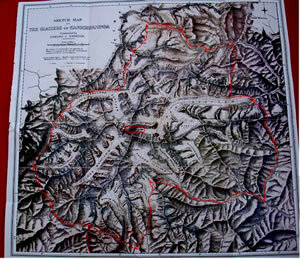 Only four expeditions have attempted trekking round Khangchendzonga massif since 1880’s till date. 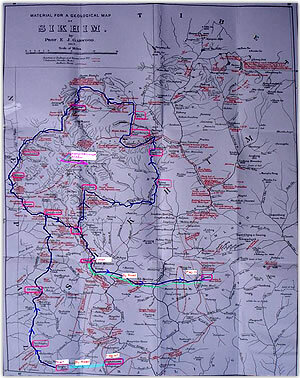 The first one in Oct 1884 by the Indian survey pundit Rinzing Namgyal (Sikkim), European expedition led by Douglas Freshfield in Sept 1899, Fransis Smythe as part of “International Expedition, 1930” which attempted Khangchendzonga summit under the leadership of Dyhrenfurth, “Parbat Abhiyatri Sangha, Calcutta” led by Lhatoo Dorjee in 1992. And there were no attempts after that. These expeditions though called themselves as round Khangchendzonga; they haven’t done the true round trek but trekked partly and taken the vehicle upon reaching road head as they moved away from the mountain. The new route that I am attempting will achieve this objective of true round trek of Khangchendzonga massif. v	Collate the historic 1899 Douglas Freshfield’s expedition with today’s physical features and the Environmental and cultural changes along the route.